The light output levels for your aquarium are very different depending on location. You can move your seneye device around the aquarium to find out the amount of light at any given point. Seneye Reef adds quality and quantity light measurements. The seneye device and seneye web server or seneye connect software allow you to place corals and plants that have a high light dependency in the best location based on the light output. The round clear window on the black back of the seneye device is used to collect aquarium light information. Understanding light is also important when trying to solve algae problems. Your seneye device is designed to be used as a directional light meter and works like a camera. Please see the note at the bottom of this page for use. All seneye products work in fresh water and salt water but the reef adds some great analytics that are geared towards keeping plants and coral alive. The main feature of the seneye reef over the seneye home and pond is that it includes a full light meter. 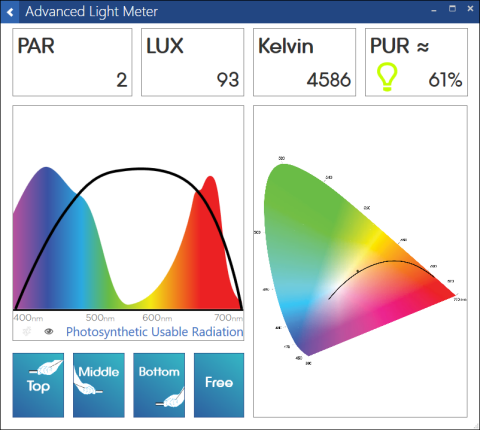 A seneye reef device provides constant light monitoring and the following measurements; PAR, LUX, Kelvin and Spectra. The information is easily viewed on the SCA light meter while the seneye device is connected. To find out more about using the seneye reef light meter functions click here. Also, why not look at the seneye web server and its new light features including PUR. All products can be upgraded to a full light meter at the seneye store. The seneye is not fitted with a cosine corrector to cut down on light noise and only report what it is looking at. For this reason, it is important that you position the seneye light meter where you want to take readings and that it is facing the light source. The device is designed to average light readings so it is important to keep the device in the same position and still while taking readings. Some LED lights use PWM (Pulse Width Modulation) to dim, this can cause readings to move about even though your eye cannot see it. For more information on light click here.